Before I dive into the nitty-gritty of our way too short three day stay in Switzerland, I want to update you guys on some of the things that have been going on since my last post (which was really too long ago). First off, I had a very unfortunate incident with my iPhone in which I accidentally left it in the pocket of my bathrobe and ran it through a wash cycle. Ouch. I’ll admit I never really understood people that destroyed their phones by jumping in the pool or smashing their screens, and then the universe hated me and this happened. I know this is really a first world problem, but since then I’ve kind of felt removed from the world. I obviously still have the iPad and the computer to keep my online life going, but I’ve realized it’s not the same. My email inbox is piling up, Facebook and Instagram are going unchecked for days at a time, etc. In much better news, the results of Italy Magazine‘s 2014 Blog Awards that I’ve mentioned in the past few posts were posted last week. I am BEYOND excited to announce that my humble blog, My Napoleon Complex, received Best Travel Blog and was runner up for Best Single Travel Post (Top Reasons to Visit Turin)! I am really honored to be recognized by Italy Magazine (a great resource for Italy lovers) among so many bloggers that I’ve followed since before moving across the Atlantic! If you voted for me and other bloggers, thank you so much for showing support. It really does make our day when we know our experiences are reaching others out there. If you’re new to my small piece of the internet, make sure to check out the About section for a start with some of my favorite posts! In high school I had the amazing opportunity to travel all across Europe with a symphonic band comprised of some of the best high school musicians across Florida (I played the clarinet). I remember it was 17 days touring seven countries. Of course, at that age and in that circumstance, you can never get the same experience you would get from visiting a place on your own. In the grand scheme of things, we only got but a taste of each country, in between being shepherded from one place to another by chaperones that were terrified of losing a kid in the middle of a foreign city like Paris or London. Still, it was enough to make it an unforgettable trip because really, how many 16 year olds get to go around Europe with their friends? One of the countries we visited and drove through was Switzerland. At the time, I was more excited to see London and Paris, but by the end of the trip I actually loved Switzerland best out of all the places we’d seen. Going back now, as an adult who has a little more travel experience, was a treat. 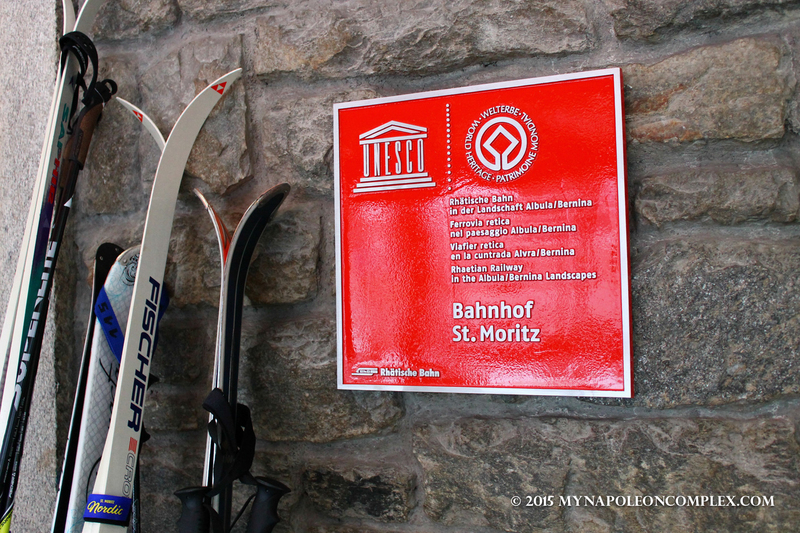 Because of our UNESCO goal, Switzerland was an absolute must because it shares a site with Italy (actually it shares more than one, but only one actually required us to cross into Swiss territory). 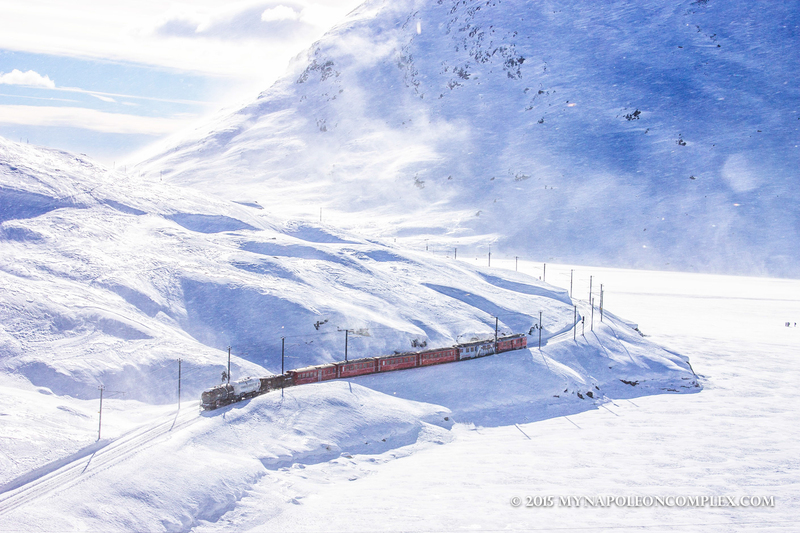 The Rhaetian Railway in the Albula/Bernina landscape is basically an amazing feat of engineering that connects the Italian town of Tirano with the Swiss city of St. Moritz (and beyond to Thusis) across the Alps. 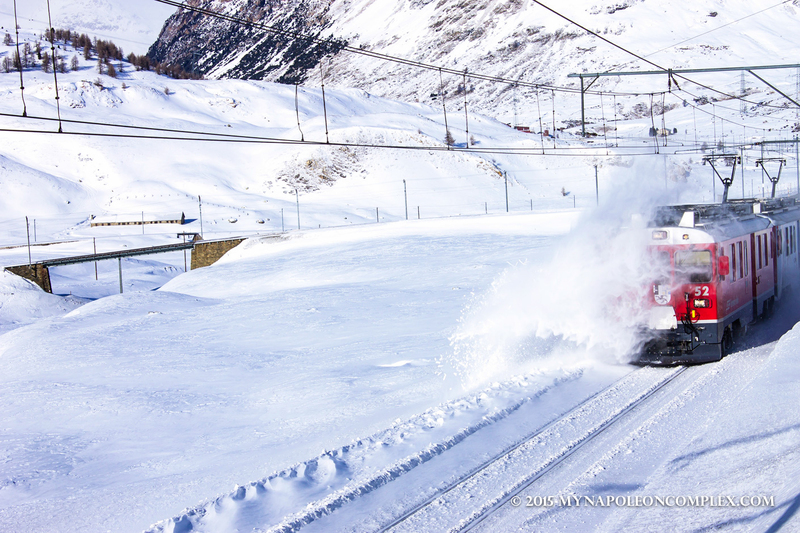 I know, I know, we drove all the way to Switzerland for a train? It’s Europe, there are trains all over the place, right? Well, honestly, I’d say it was more than just a regular train ride. I’d say it was comparable to the train ride between London and Paris (not that I’ve been, but Jaime has). 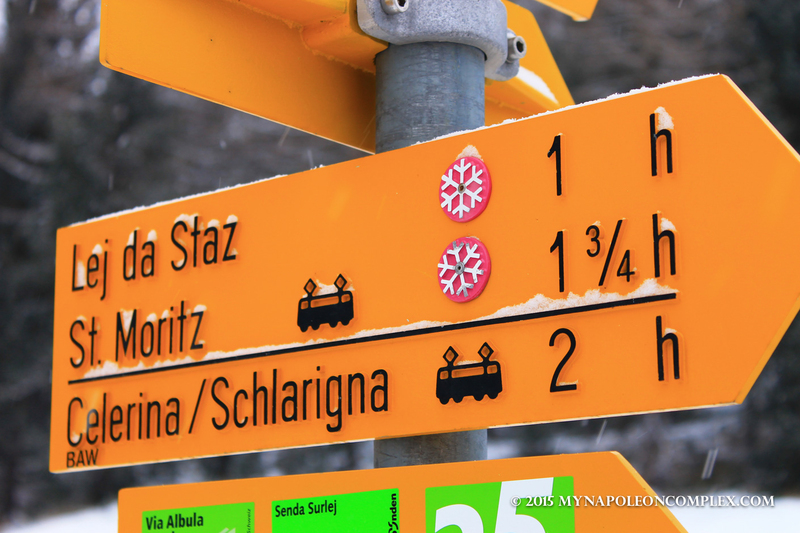 Ideally, we would have taken the train from Tirano to St. Moritz because from what I saw the views are magnificent, but the cost was more than we were willing to spend for a weekend, so instead we drove and rode a small section of the line in St. Moritz. 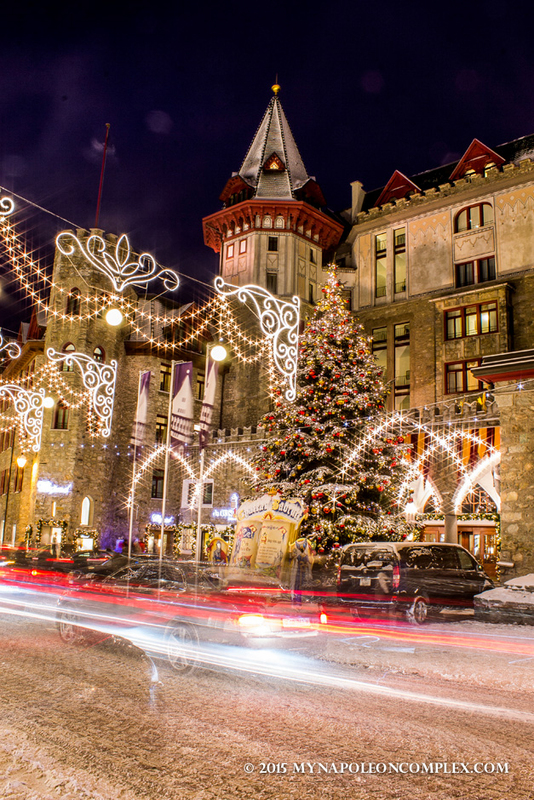 St. Moritz is really the quintessential city for jet setters. The playground of the rich and famous, the streets are lined with amazing five star hotels and designer stores, and people walking around shopping, dining, and skiing. I mean, what can I say? It was beautiful and I would have gladly stayed at any one of those fancy hotels, but it’s not a place for people with budgets. 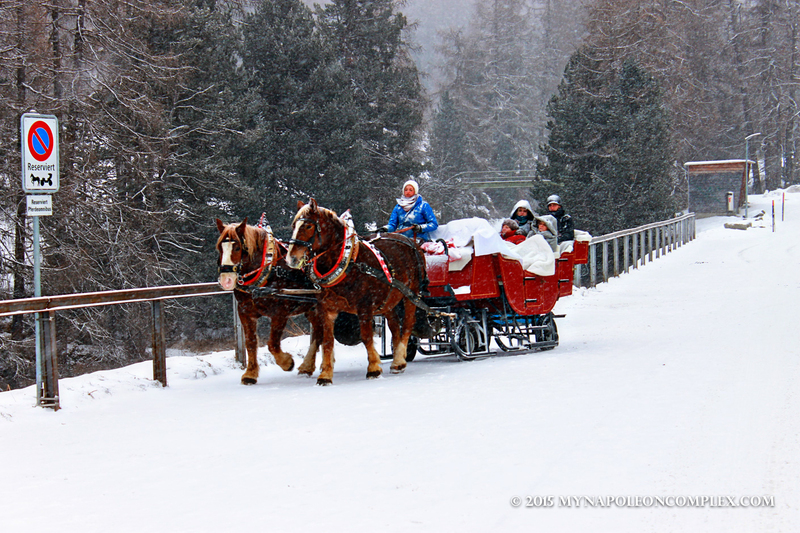 Being that it was the weekend after Christmas, the prices were sky high, so we stayed about 30 minutes outside of St. Moritz and drove in for the day. One of my favorites, if you look closely the bench says St. Moritz! When we drove to St. Moritz early in the morning, it was snowing like crazy (maybe not Boston crazy though, from what I’ve heard). If there’s one thing I detest about snowy winters it’s the driving. My experience with it is limited to two winters, and even though Jaime has been in Ohio for longer than I have and is really good at driving in the snow, we are really Caribbean people at heart. So, basically, we were terrified of driving the mountains through a bunch of unpaved roads. Some of the climbs were so steep that instead of salt, there would be gravel on the roads to provide traction. I had never seen anything like that before. 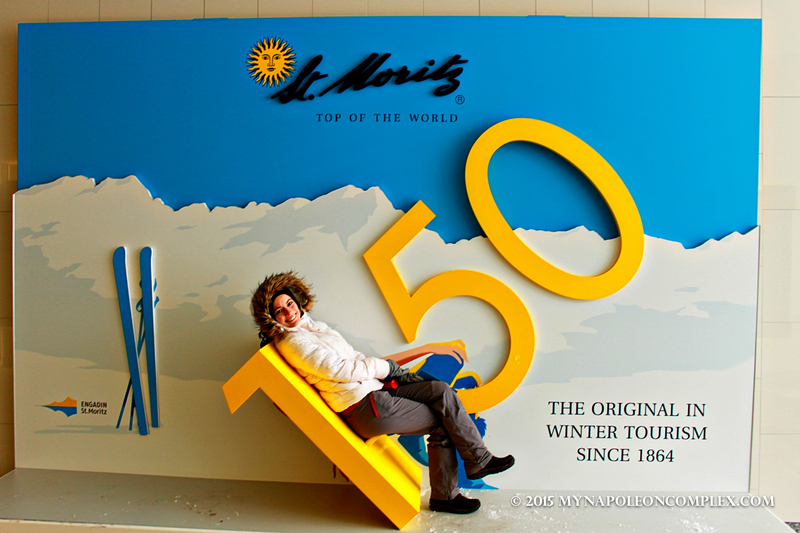 Needless to say we were extremely relieved to finally reach St. Moritz and park the car. 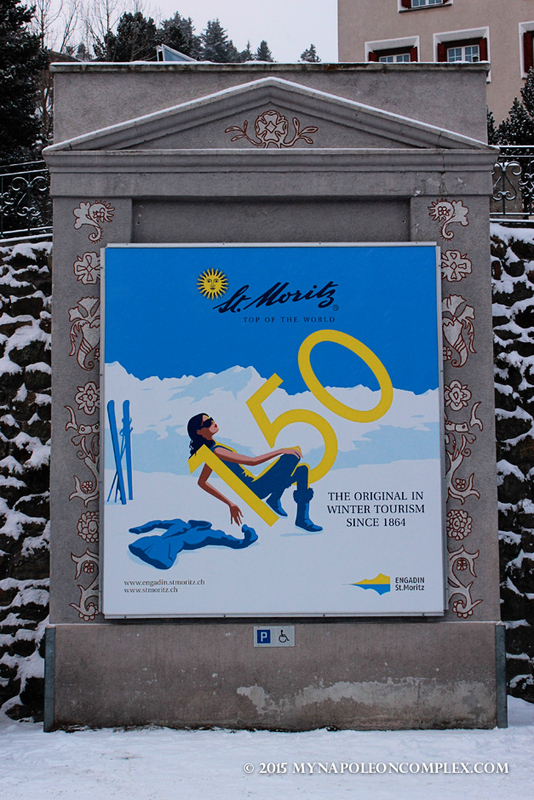 We walked around St. Moritz and explored as much as the cold allowed (times like those made me appreciate Rome’s mild weather). Then, we drove the Rhaetian Railway to the next town to experience the train. The next town, Poschiavo I think it was called, was kind of dead, but the train ride was worth it. We stayed until nightfall to get a glimpse at all the Christmas lights and decorations throughout the city before heading back across the treacherous roads to our hotel. 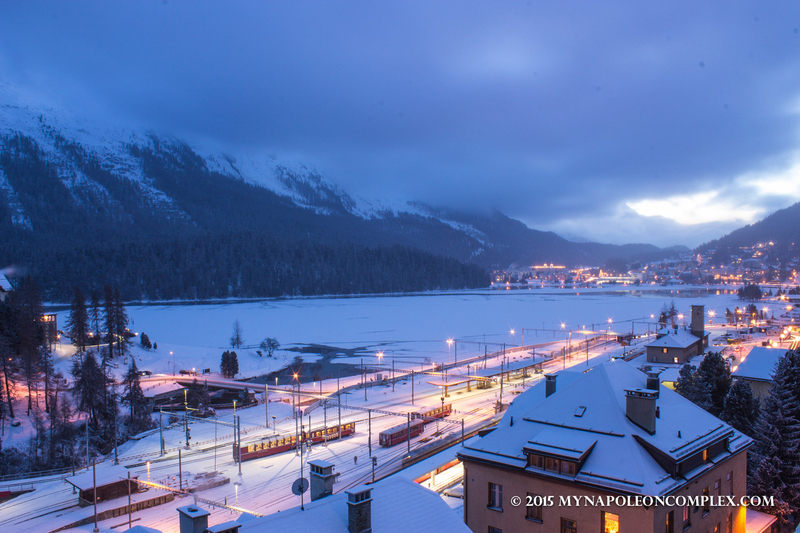 St. Moritz at twilight with the Rhaetian Railway trains. 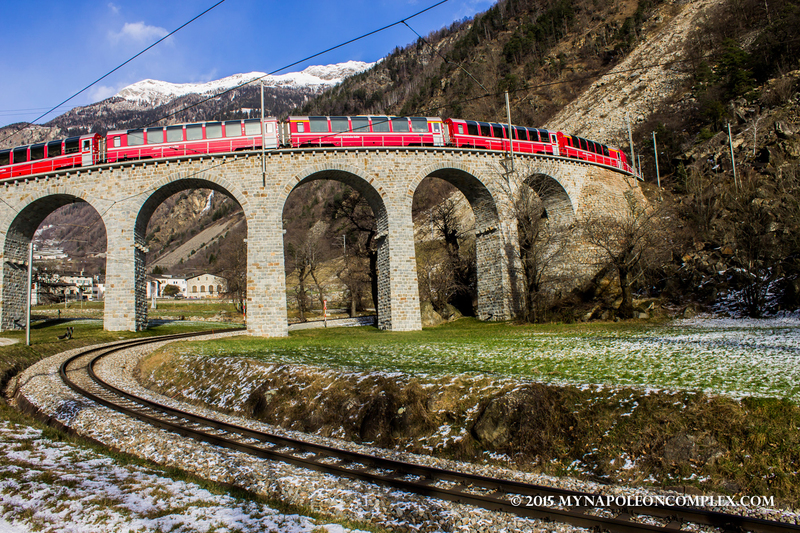 Two days later, when we were driving back to Italy, instead of taking the shortest route, we detoured a little bit to follow the Bernina pass and arrive at the last Swiss town before the train crosses the Italian border, Brusio. 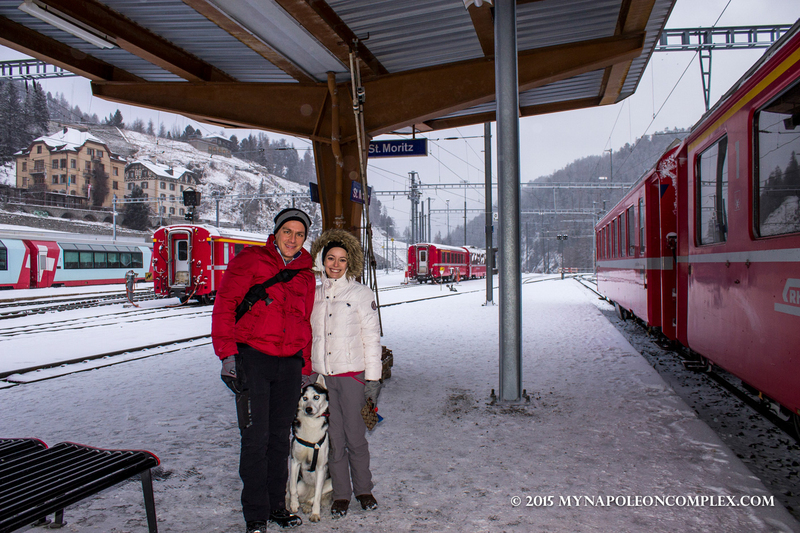 Along the way, we marveled at the amazing winter landscapes and followed one specific train all the way to Tirano! I don’t think I had seen snow piled as high as it was on this road and it was only December! The train tracks were sometimes parallel to the road. 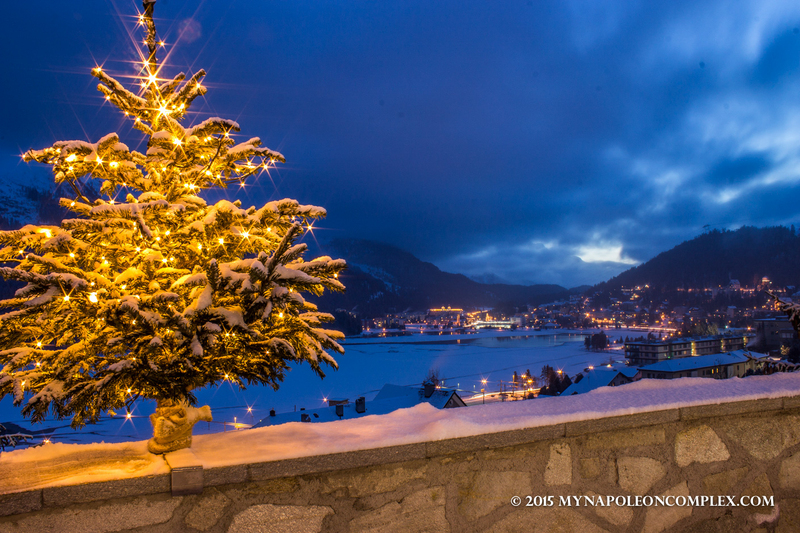 Postcard perfect, it looks like a scene from a miniature Christmas village! 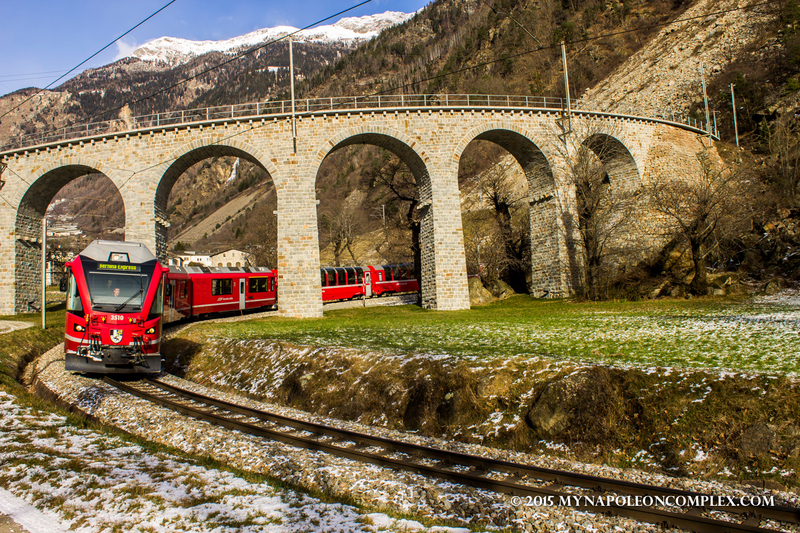 In Brusio, the train goes into a very photographic spiral viaduct. In case you’re like me and don’t know the scientific explanations for this, according to Jaime, the train goes into the spiral descent to maintain the 7% gradient needed so that it doesn’t slip on the tracks. 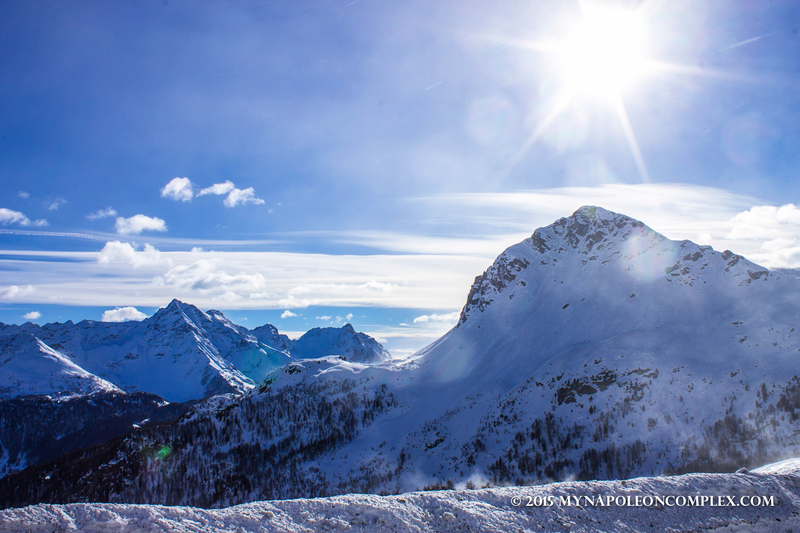 From this point, it’s I’d say about 5 km away from its destination, Tirano, Italy! This picture alone made the whole trip worth it for me.